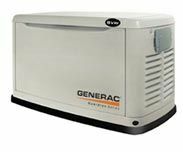 Owning a GENERAC generator is easy and affordable. Protect your family and home from damaging, dangerous power outages for about the same cost of a central air conditioning unit. Increase your home value and provide your family instant relief when the power goes out. A power outage during the winter results in the loss of light and could result in the loss of heat and burst pipes. A power outage in warm weather climates could result in the loss of air conditioning and mold damage. In any climate, food left in refrigerators or freezers without power is likely to spoil. These are significant issues with expensive consequences. Luckily, they can be avoided. As the #1 selling home standby generator, GENERAC automatic standby generators provide peace of mind for home and business owners. No other name in the industry compares. No fueling. No manual start. No extension cords. Higher outputs for greater starting power. 1/3 the sound level of a portable generator. Generac OHVI® engine built for high demand generator use. Need help sizing a standby generator? Call us today and we’ll come out, free of charge, and do a Power Needs Analysis. This will tell us exactly how much power you’ll need out of your generator. Generac automatic standby generators provide peace of mind for you and your family. Every Generac Series generator offers 24/7 power protection, hands-free operation and the easiest installation available. Sales, parts and service. ** Prices includes composite mounting pad, transfer switch & generator. This price does not include installation (labor), parts, battery, permit. Smaller air-cooled models, the economical option preferred by most customers, provide essential circuit protection for smaller homes. These pre-wired, pre-packaged units include the 100 Amp transfer switch with appropriate load center and virtually everything needed for installation. Installation can be completed in as little as one day. Why should you choose GENERAC® generators over other brands? Very simply, GENERAC has everything you need... superior product, unprecedented availability, the largest generator service organization in the nation and, believe it or not, Industry best pricing. How do we do it? The same way we've been doing it for over 45 years. We design and manufacture our own product. We develop our own control systems and communications software and we create leading edge technologies that drive the future of standby power. Because we're more than an assembler, we employ cost-effective manufacturing techniques into our processes and we pass the cost savings on to you. We believe that everyone deserves the protection of standby power. The products we make are the essence of quality, performance and reliability. That's why GENERAC sells more standby power generators than all of our competitors combined. If America prefers GENERAC, shouldn't you? Imagine your life without power. The conveniences you enjoy and the essentials you rely on are suddenly gone. No lights, no heat, no air conditioning. No sump pump to keep your basement dry. The food in your refrigerator spoils. But it doesn't have to be that way. 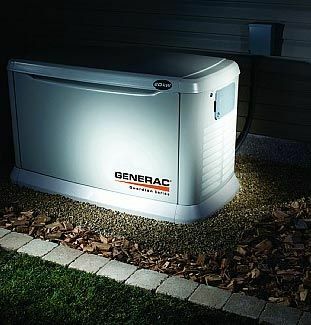 With a GENERAC® Standby Generator, your power will return within seconds of an outage, keeping your home and your family safe and secure. Because it's fully automatic, your GENERAC Standby Generator will produce electricity as soon as it senses a power outage - 24 hours a day, 365 days a year, even if you're away. Unlike a portable generator, there are no switches to flip, extension cords to plug in or gas tanks to fill. 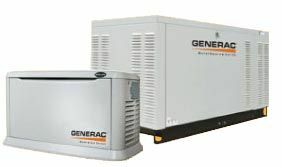 GENERAC Automatic Standby Generators are connected to your regular natural gas or propane service, providing you with continued power during an outage of any duration.